In a previous section of this book, I pointed out that in dim light and dark adapted conditions, our rod receptors are more sensitive than our cone receptors. As can be seen in the figure on the right, the peak sensitivity of the rods occurs at shorter wavelengths than does the peak sensitivity of the cone receptors. At high levels of illumination the rods receptors saturate. Saturation means that after a certain level of illumination the rod responses cease to increase even though the illumination levels continue to increase. If you place a horizontal straight edge near log sensitivity of -1 and lay it across the graph you will see that the cones have approximately the same sensitivity to blue (near 450 nm) as they do to red (near 650 nm). So at high levels of illumination where the rods are saturated it is not difficult to adjust a blue and red light to be approximately equal in brightness. If we now reduce the illumination to near cone threshold we enter the range called mesopic vision, where the rods exhibit considerably sensitivity and we are still above cone threshold. 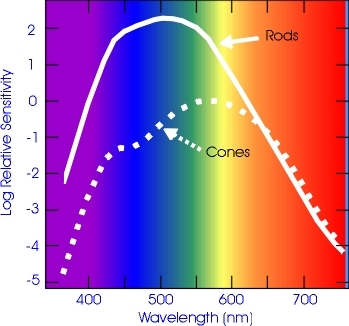 Since the rods are much more sensitive to short wavelengths than are the cones these wavelengths will appear brighter. If the illumination is reduced to below cone threshold color vision will disappear and because the rods are more sensitive to short wavelengths than to long ones, blue colors will appear brighter, albeit, colorless.